Rarely would a new launch excite me so much that I would be waiting for it expectantly, let alone instantly parting with my own cash to make sure I had it immediately, but today we are not talking any old launch, but new sparkling fragrances from Weleda. If you have been a regular reader for some time you will know I love Weleda products, the Almond skincare and body care ranges and the pomegranate body products are two of my favourites and most repurchased over the years, especially the Pomegranate shower gel which is a permanent feature in my bathroom. To compliment the existing bath and body ranges Weleda have launched three new natural perfumes, these have already been available in Europe for a couple of months but are new to the UK. A lot of the press coverage I have seen is saying that these launch April, however I bought this as a customer from the Weleda UK site, so can vouch for the fact that they are in fact available now. If you are familiar with the range the three new fragrances stay true to three of the best selling ranges, Rose, Pomegranate and Sea Buckthorn scents. I was particularly happy about this as I love the scents just the way they are and was a little concerned that the perfumes wouldn’t match what I already knew and loved, but I needn’t had been. Agrume Jardin de Vie – Has the sparkling citrus notes of grapefruit and mandarin and woody notes of sandalwood. It is bright, fresh and uplifting. A sample of this one was included in my order and I can vouch for the fact that if you are already a fan of the Sea Buckthorn range, this will appeal to you. Grenade Jardin de Vie – Fruity notes of orange, davana, neroli and the warmth of Vanilla come together in this pomegranate inspired perfume. It stays true to the other products in the range and has the same uplifting scent, this to me smells of spring and happiness and I am delighted to have it in collection, in fact I doubt I will ever be without it. Rose Jardin de Vie – A floral offering with Rose, Geranium and Ylang Ylang. The only one of the three I have yet to try, the rose body care is beautifully feminine and light, so I am expecting the fragrance to follow the same pattern. All three perfumes come in heavy glass bottles and retail at £19.95 for 50 mls, affordable perfumes at last. They are most definitely more of a fresh and light Eau de Toilette rather than a heavy, lingering perfume, perfect for something fresh, fruity or floral. 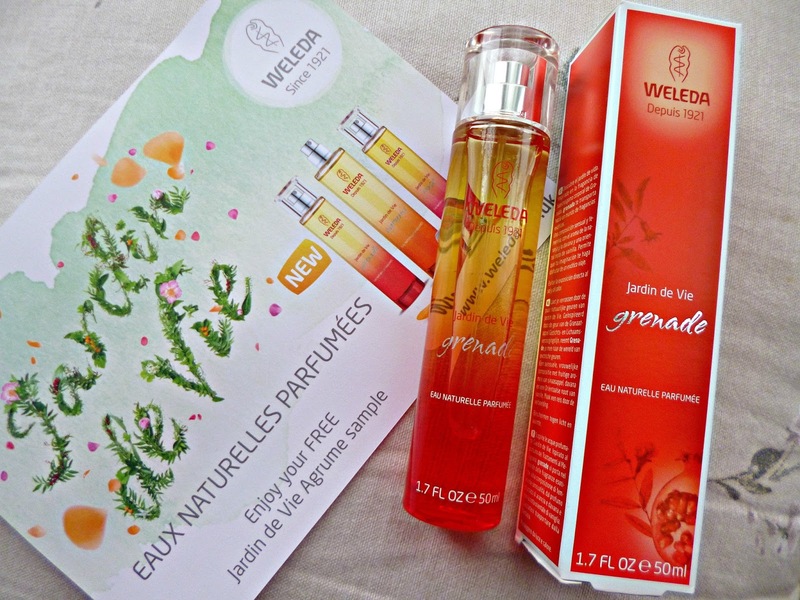 As always with Weleda the fragrances are 100% natural made from essential oils and certified by NATRUE. Weleda also has some brilliant deals at the moment on the shower gel and fragrance duos which are not to be missed. You can shop the range here at www.weleda.co.uk. Needless to say I love them and will be adding them all to my collection.